Another TROPICAL KINGBIRD has been sighted on Hornby Island. The bird was seen feeding on red berries in a garden on Anderson Drive, Hornby Island. No picture as of yet but hopefully one will taken. The Sunday Bird Walk went to Nanaimo River Estuary in Nanaimo. Among the highlights were the sighting of a seven Western Meadowlarks and a Northern Shrike. We had some great views of a Short-eared Owl and a Northern Harrier flying right over us at the start of the walk. Eighteen birders found the following forty-two species: Great Blue Heron, Canada Goose, Trumpeter Swan, American Wigeon, Mallard, Bufflehead, Common Goldeneye, Barrow's Golden-eye, Red-breasted Merganser, Greater Scaup, Northern Pintail, Gadwall, Common Merganser, Common Loon, Double-crested Cormorant, Pelagic Cormorant, Greater Yellowlegs, Bald Eagle, Northern Harrier, Red-tailed Hawk, Short-eared Owl, Glaucous-winged Gull, Belted Kingfisher, Anna's Hummingbird, Northern Flicker, Downy Woodpecker, Northern Shrike, Northwestern Crow, Common Raven, Western Meadowlark, American Robin, European Starling, Spotted Towhee, Bewick's Wren, Ruby-crowned Kinglet, Song Sparrow, White-crowned Sparrow, Golden-crowned Sparrow, Dark-eyed Junco, House Finch, Purple Finch and Pine Siskin. A Pileated Woodpecker is visiting a backyard suet feeder along Barrington Road in Nanaimo. A White-throated Sparrow was seen in the 2500 block of Glenayr Drive in Nanaimo. A Varied Thrush and a Hutton's Vireo were seen at Jingle Pot R.V. Park in Nanaimo. The Wednesday Bird Walk went to Deep Bay today. Among the highlights were a large number of Long-tailed Ducks--many of them very close to shore. Two Trumpeter Swans were in the marina and off shore, looking towards Denman Island, we saw large flocks of Horned Grebes, Red-necked Grebes as well as an Ancient Murrelet. From Nile Creek we saw a fishing boat with a huge mass of Gulls in a feeding frenzy along with a Common Murre and a Rhinoceros Auklet. Rock Pigeon, Belted Kingfisher, Ringed-necked Pheasant, Northern Flicker, Northwestern Crow, Common Raven, American Robin, European Starling, Song Sparrow, White-crowned Sparrow, Dark-eyed Junco, Brewer's Blackbird ,Purple Finch, House Finch, Red Crossbill, Pine Siskin and American Goldfinch. An Anna's Hummingbird was seen in the 5400 block of Kenwill Drive in Nanaimo. A MERLIN was seen in the 2500 block of Glenayr Drive in Nanaimo. OUT OF TOWN RARE BIRD ALERT "HARRIS'S SPARROW"
A first winter HARRIS'S SPARROW was seen at a feeder after a heavy rain storm in the 2300 block of Pacific Rim Highway at Ucluelet on the west side of Vancouver Island. The Harris's Sparrow usually spends the summer in the high Arctic and winters in the mid-western USA states. Monday November 26, 2007@ 7:30 pm. Stan Orchard will speak on "Bullfrog Control Programs"
The Wednesday Bird Walk on November 28, 2007 will be going to the Englishman River Estuary, Plummer Road side. Meet at the Visitor Centre in Parksville on Highway 19A and Northwest Bay Road at 9 a.m. or at corner of Plummer Road and Shorewood Drive at about 9:10 a.m. The Sunday Bird Walk on December 02, 2007, will be going to Buttertubs Marsh in Nanaimo. The Sunday Bird Walk went to Neck Point Park in Nanaimo. Among the highlights were the sighting of a large flock of Pine Siskins and Red Crossbills and the resident Spotted Sandpiper was seen at Sunset Beach roosting on a log. Seventeen birders found the following forty species: Mallard, Bufflehead, Common Goldeneye, White-winged Scoter, Surf Scoter, Common Merganser, Common Loon, Pacific Loon, Horned Grebe, Red-necked Grebe, Harlequin Duck, Brandt's Cormorant, Double-crested Cormorant, Pelagic Cormorant, Spotted Sandpiper, Black Oystercatchers, Black Turnstones, Bald Eagle, Bonaparte's Gull, Mew Gull, Glaucous-winged Gull, Belted Kingfisher, Anna's Hummingbird, Northern Flicker, Downey Woodpecker, Northwestern Crow, Common Raven, Spotted Towhee, Chestnut-backed Chickadee, Red-Breasted Nuthatch, Brown Creeper, Winter Wren, Golden-crowned Kinglet, Ruby-crowned Kinglet, Song Sparrow, Fox Sparrow, Golden-crowned Sparrow, Dark-eyed Junco, Pine Siskin and Red Crossbill. A Blue Jay, an Eared Grebe and an immature Yellow-billed Loon were seen in Sooke. 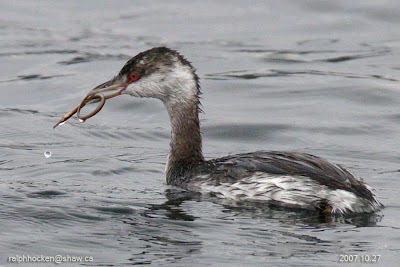 An adult Clark's Grebe was seen offshore from the west coast road at the lookout area at Otter Point near Sooke. Four Northern Pintail were seen at Westwood Lake in Nanaimo. Rare Bird Alert " TROPICAL KINGBIRD"
A TROPICAL KINGBIRD was seen at about 2:00 p.m. at the Nanaimo River Estuary, Raines Road side. The Kingbird was seen about 100 yards from the Viewing Tower looking towards Duke Point. A Northern Shrike, a Northern Harrier, three Western Meadowlarks, a Wilson's Snipe, two Short-eared Owls hunting together and one TROPICAL KINGBIRD were seen at the Nanaimo River Estuary, Raines Road side. One Anna's Hummingbird was seen visiting feeders in the 3400 Block of Blackfoot Way in Nanaimo. Canada Goose, Trumpeter Swan, American Wigeon, Mallard, Harlequin Duck, Surf Scoter, White-winged Scoter, Black Scoter, Long-tailed Duck, Bufflehead, Common Goldeneye, Barrow's Goldeneye, Common Merganser, Red-breasted Merganser, Red-throated Loon, Pacific Loon, Common Loon, Horned Grebe, Red-necked Grebe, Double-crested Cormorant, Great Blue Heron, Bald Eagle, Cooper's Hawk, Black Oystercatcher, Black Turnstone, Dunlin, Bonaparte's Gull, Mew Gull, California Gull, Thayer's Gull, Western Gull, Glaucous-winged Gull, Glaucous Gull, Belted Kingfisher, Northern Flicker, Northwestern Crow, Chestnut-backed Chickadee, American Robin, European Starling, Spotted Towhee, Song Sparrow, Dark-eyed Junco, Red-winged Blackbird, Brewer's Blackbird, House Finch and Red Crossbill were seen at the Little Qualicum River Estuary just north of Qualicum Beach. 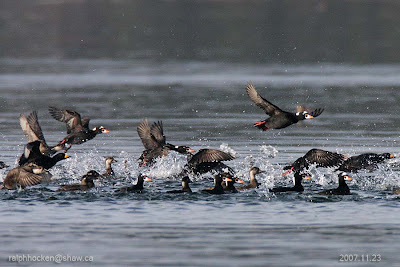 White-winged Scoter, Black Scoter, Long-tailed Duck, Bufflehead, Common Goldeneye, Common Merganser, Red-breasted Merganser, Red-throated Loon, Pacific Loon, Common Loon, Horned Grebe, Red-necked Grebe, Double-crested Cormorant, Pelagic Cormorant, Bald Eagle, Black Oystercatcher, Black Turnstone, Bonaparte's Gull, Mew Gull, Ring-billed Gull, Thayer's Gull, Glaucous-winged Gull, Rock Pigeon, Northern Flicker, Northwestern Crow, Chestnut-backed Chickadee, European Starling, Song Sparrow, Dark-eyed Junco, House Finch and Pine Siskin. An Anna's Hummingbird is visiting feeders in the 6500 block of Ptarmigan Way in Nanaimo and along Remora Place in Nanoose Bay. Eighty Surfbirds were seen at Neck Point Park in Nanaimo. Anna's Hummingbirds are visiting feeders in the 200 block of Dawkins Lane in Nanaimo. One immature Black-legged Kittiwake and a Slaty-backed Gull at Jordan River. A 3rd year Glaucous Gull at Whiffin Spit. Snow Goose and Cackling Geese in Sooke. Winter storms tend to take birds off their normal course. Keep an eye out for unusual species during stormy weather. If you see anything unusual give us a call at the Bird Store. A female Long-tailed Duck was sighted about 100 metres offshore of Jacks Road in Lantzville. Four Trumpeter Swans flew over Andrea Crescent in Lantzville. A large flock of Northern Pintail Ducks were seen on the Englishman River Estuary in Parksville. An immature Tundra Swan was seen in the 7700 block of Anderson Drive, Whaling Station Bay, Hornby Island. The Wednesday Bird Walk on November 21, 2007 will be going to Deep Bay. Meet at the Visitor Centre in Parksville on Highway 19A and Northwest Bay Road at 9 a.m. or at the parking area at the Deep Bay Marina near the Grocery Store at about 9:40 a.m. 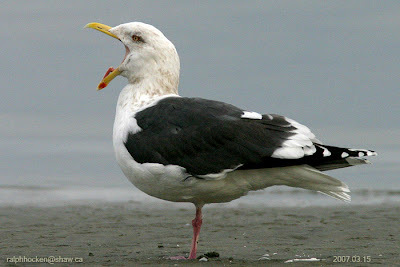 The Sunday Bird Walk on November 25, 2007, will be going to the Nanaimo River Estuary. Meet at the Birdstore at 9:00 am or at the parking area at the end of Raines Road at about 9:30 a.m.
OUT OF TOWN RARE BIRD ALERT "IVORY GULL"
A Ivory Gull was seen at Matsqui Flats near Abbotsford on the lower mainland. The Ivory Gull winters in the Arctic Sea and is a casual visitor along the Atlantic Coast. The Sunday Bird Walk went to the Nanoose Bay Estuary in Nanoose Bay. 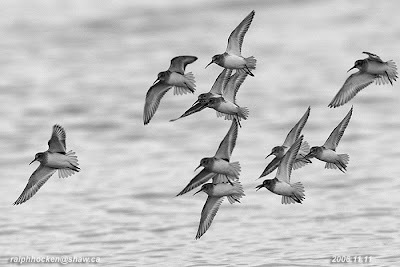 Among the highlights were the sighting of a Common Murre in the Bay, over three hundred White Scoters, an estimated 3000 Bushtits moving in a hugh cloud from bush to bush and four Dunlin landing close to shore. Fourteen hardy birders found the following thirty-four species: Common Murre, Canada Goose, American Wigeon, Mallard, Green-winged Teal, Northern Pintail, Bufflehead, White-winged Scoter, Common Merganser, Red-breasted Merganser, Common Loon, Pacific Loon, Horned Grebe, Double-crested Cormorant, Pelagic Cormorant, Dunlin, Great Blue Heron, Bald Eagle, Red-tailed Hawk, Mew Gull, Glaucous-winged Gull, Northwestern Crow, Common Raven, American Pippit, European Starling, Spotted Towhee, House Finch, Song Sparrow, Golden-crowned Sparrow, Dark-eyed Junco, Bushtit, Purple Finch, and Red Crossbill. OUT FOX TOWN RARE BIRD ALERT "ROSS'S, GULL"
This afternoon there was a non-breeding Adult Ross's Gull on Tachick Lake southwest of Vanderhoof (west of Prince George). 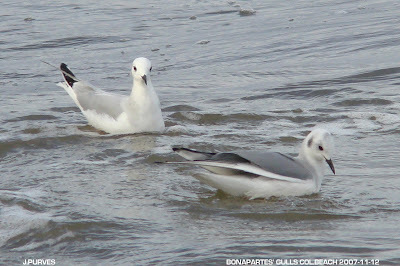 The Ross's Gull is an Old World Arctic species that usually winters at sea. The Wednesday Bird Walk went to Columbia Beach at French Creek. The rain was with us for the walk short. We saw six species of gulls--Bonaparte's Gull, Mew Gull, Ring-billed Gull,California Gull, Thayer's Gull and Glaucous-winged Gull. We also saw a large number of Pacific Loons and shorebirds including Black-bellied Plovers,Black Oystercatchers, Black Turnstones and Dunlin. Two Great Horned Owls were seen along Morrell Circle in Nanaimo. A Ringed-necked Pheasant and two flocks of Trumpeter Swans were seen near the Cottonwood Golf Course in south Nanaimo. A Rough-legged Hawk was seen flying out from a perch near the Qualicum Beach exit on highway 19. Ten Trumpeter Swans were seen flying over highway 19 near Courtenay. Golden-crowned Kinglet, American Robin, European Starling, Yellow-rumped Warbler, Dark-eyed Junco, House Finch, Red Crossbill and Pine Siskin were seen on the Lazo Marsh and the ocean at Comox. Over thirty-six Dark-eyed Juncos, three Northern Flickers, a Spotted Towhee and six American Robins were seen in a yard along Cedar Road in Cedar. A Wilson's Snipe was seen along Port Trail Drive near Buttertubs Marsh in Nanaimo. Anna's Hummingbirds have been seen in the 200 block of Dawkins Lane, in the 700 block of Aulds Road and in the 3300 block of Edgewater Drive in Nanaimo. Spotted Towhee, Song Sparrow, Dark-eyed Junco, Red-winged Blackbird, Brewer's Blackbird, Purple Finch, House Finch and Pine Siskin were seen around the edge of Morningstar Golf Course in French Creek. Anna's Hummingbirds are visiting feeders in the 7400 block of Aulds Road in Lantzville. RARE BIRD ALERT "HOODED WARBLER" The Hooded Warbler is normally found in the eastern USA during the summer and is fairly common in swamps, moist woodlands. It winters in southern Mexico, Central America, and Caribbean. olive greenish brown. White in tail visible when it moves. Listen for sharp chips.Location and Access: Park in BC Hydro Parking lot and walk west (toward the generating station) on the paved part of the Canyon View trail, across the front of the generating station and up the stairs and trail on the north side no further than the look-out over the penstocks. The bird was vocalizing and flitting around in a large patch of blackberry that is growing on the chain-link fence that separates the penstock/generating station yard from the treed area to the north. An Anna's Hummingbird is visiting Chinese Lantern Plants in the 5600 block of Lost Lake Road in Nanaimo. The Sunday Bird Walk on November 18, 2007, will be going to Neck Point Park in Nanaimo. Meet at the Birdstore at 9:00 am or at the parking lot at Neck Point off Hammond Bay Road about 9:20 a.m.
A Hooded Warbler was seen behind the John Hart Generating Station on the Canyon View Trail in Campbell River at ~10:30 AM Sunday November 4, 2007. Bird Description: Male bright yellow face surrounded by continuous black throat bib, neck ring and cap on top of head and nape. Underparts bright yellow, back olive greenish brown. White in tail visible when it moves. Listen for sharp chips. Location and Access: Park in BC Hydro Parking lot and walk west (toward the generating station) on the paved part of the Canyon View trail, across the front of the generating station and up the stairs and trail on the north side no further than the look-out over the penstocks. The bird was vocalizing and flitting around in a large patch of blackberry that is growing on the chain-link fence that separates the penstock/generating station yard from the treed area to the north. A Tropical Kingbird was seen on Martindale Flats in Victoria. The bird was flycatching from a dead snag near the new big mansion towards Mallard Drive on the north side of Martindale Road. The Tropical Kingbird is a Central American bird that is a rare, but regular visitor during fall and winter along the west coast of British Columbia. The Sunday Bird Walk went to the Little Qualicum River Estuary. Twenty-two birders found the following forty-four species: Canada Goose, American Wigeon, Mallard, Common Goldeneye, Buffhead, Harlequin Duck, Surf Scoter, White-winged Scoter, Black Scoter, Long-tailed Duck, Red-necked Grebe, Common Merganser, Red-breasted Merganser, Common Loon, Pacific Loon, Horned Grebe, Double-crested Cormorant, Great Blue Heron, Bald Eagle, Killdeer, Dunlin, Spotted Sandpiper, Black-bellied Plover, Black Turnstone, Black Oystercatcher, Ruby-crowned Kinglet, Bonaparte's Gull, Mew Gull, California Gull, Thayer's Gull Glaucous-winged Gull, American Robin, Belted Kingfisher, Northwestern Crow, Common Raven, Brewer's Blackbird,Chestnut-backed Chickadee, Golden-crowned Sparrow, Song Sparrow, Pine Siskin, Dark-eyed Juncos, Spotted Towhee, House Finch and American Goldfinch. A Barred Owl was seen hunting near the Cat Stream off Beaconsfield Road in Nanaimo. A Trumpeter Swan was seen on a marsh near Cedar Road and Macmillan Road in Cedar. A Yellow-billed Loon was seen at Otter Point, off the West Coast Road near Sooke. The Yellow-billed Loon breeds on tundra lakes and rivers in the high Arctic. They migrate for the winter down the west coast of Canada. A Great Horned Owl was calling at the Colliery Dam Park in Nanaimo. A Barred Owl was seen along Owen Road in Lantzville. The Wednesday Bird Walk went to the Englishman River Estuary, Shelly Road side in Parksville. Among the highlights were eight Trumpeter Swans flying past the Art Gallery, one Eurasian Wigeon and first of the season's sighting of Common Goldeneye and Bufflehead. Eleven birders found the following forty-eight species: Canada Goose, Trumpeter Swan, Eurasian Wigeon, American Wigeon, Mallard, Northern Pintail, Green-winged Teal, Harlequin Duck, Surf Scoter, White-winged Scoter, Bufflehead, Common Goldeneye, Hooded Merganser, Common Merganser, Red-breasted Merganser, Pacific Loon, Horned Grebe, Brandt's Cormorant, Double-crested Cormorant, Great Blue Heron, Bald Eagle, Mew Gull, Ring-billed Gull, Thayer's Gull, Glaucous-winged Gull, Belted Kingfisher, Northern Flicker, Northwestern Crow, Common Raven, Chestnut-backed Chickadee, Bushtit, Red-breasted Nuthatch, Brown Creeper, Bewick's Wren, Winter Wren, Golden-crowned Kinglet, American Robin, European Starling, Spotted Towhee, Song Sparrow, White-crowned Sparrow, Golden-crowned Sparrow, Dark-eyed Junco, Brewer's Blackbird, Purple Finch, House Finch, Red Crossbill and Pine Siskin. Anna's Hummingbirds were seen in the 6900 block of Rosalyn Avenue in Lantzville. Two Anna's Hummingbirds are visiting feeders in the 100 block of Southview Road in Powell River. A White-throated Sparrow was seen feeding with Dark-eyed Juncos in a backyard on Andrea Crescent in Lantzville. A Barred Owl landed on a deck railing and had his photo taken in the 5500 block of Avro Way near Brannen Lake in Nanaimo. A White-throated Sparrow (white striped form) was visiting a ground feeding area in the 5300 block of Hammond Bay Road in Nanaimo. Anna's Hummingbirds were seen visiting feeders in the 4900 block of Bella Vista in Nanaimo. A juvenile Northern Shrike was photographed at the Nanoose Bay Estuary in Nanoose Bay. An American Bittern was seen flying above Buttertubs east and west Marshes in Nanaimo. A Yellow-headed Blackbird was seen in a pond at the Craig Bay area in Parksville. Speaker: Morgan Black, Topic: "Bats"
The Wednesday Bird Walk on November 07, 2007 will be going to Columbia Beach. The Sunday Bird Walk on November 11, 2007, will be going to the Nanoose Estuary. (turn unto Arlington Road off Highway 19) about 9:20 a.m.